Combining a bike ride with a bus ride is a perfect way to extend the range of your green commute. Get comfortable with loading your bike onto transit racks and you’ll have a whole new set of transportation options. 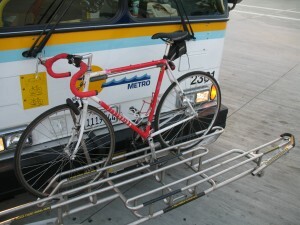 All METRO buses have racks with space for three standard bicycles. Simply pull down the rack, place your bicycle in the rack, and pull the spring-loaded arm over the front wheel. Make sure your bicycle is secure, then board the bus. If a bus’ bicycle racks are full, it is the driver’s discretion whether to allow you to board the bus and hold your bike safely. If you have a folding bike, you are generally permitted to bring it onboard as long as it is folded, so long as there is space. Find out more about using your bike on Santa Cruz METRO buses on their site.